Greetings all, and welcome back for F.F.F., Famous Fake Friday. Today I thought I might talk to you about a supposed fake, because here at LITL, we are all about controversy. And, the arguments for this particular work being a fake are pretty convincing in my opinion. Again, this doesn’t mean that this is a forgery, but it very well could be. 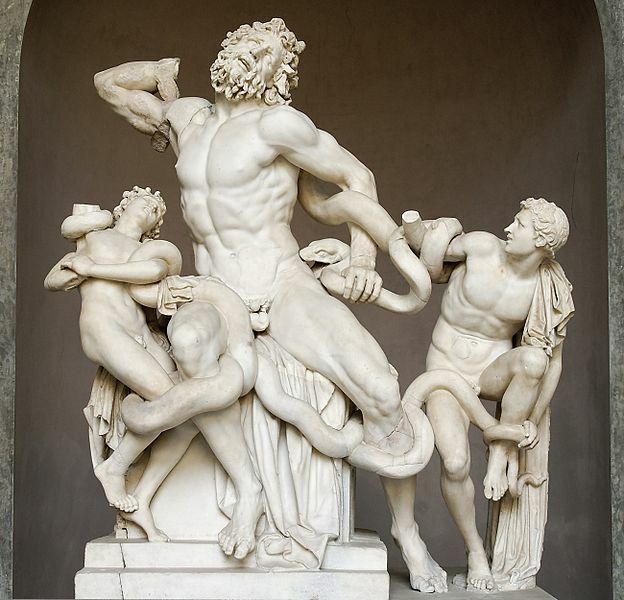 The Laocoon statue now residing in the Vatican was, until recently, unanimously believed to be a antique sculpture cited by Pliny the Elder and depicting the tragic end of Laocoon and his sons, who were strangled to death by sea serpents. Whether due to his distrusting of the Trojan Horse or an earlier offense to the gods is uncertain. It is an incredibly adept work of sculpture, the anguish in Laocoon’s face, the contorted muscles, worthy of even of Michelangelo himself. Which is rather ironic, given that there’s a real possibility Michelangelo carved the thing himself. Now, before you all reach out and choke me through the inter-webs, I am not making up this argument. In 2005, Lynn Catterson published the article “Michelangelo’s Laocoon?”. (*Unfortunately the article is not freely available on the web, but I had to throw that in there to prove I wasn’t making this up! There is also this article by the New York Times that references Catterson’s discovery, which should give some of the basics from the article.) In it, Catterson outlines 1) Michelangelo’s known history of forging antiquities, 2) the fact that the mammoth sculpture was conveniently dug up from the back garden of one of his friends, 3) Michelangelo was present at the unearthing of the statue, and even managed to not only correctly guess how the broken right arm would have looked, but was also chosen to replace the missing limbs from the damaged statue, and was able to do so rather quickly (almost as if he knew…). Moreover, Catterson found a drawing at the Ashmolean Museum in Oxford by Michelangelo that looks suspiciously like the back and arms of Laocoon, potentially dated from before the unearthing of the statue itself. She also went through his bank records and noticed large quantities of marbles being ordered that have not yet been accounted for in other sculptures. What do you think, is the Laocoon a forgery?